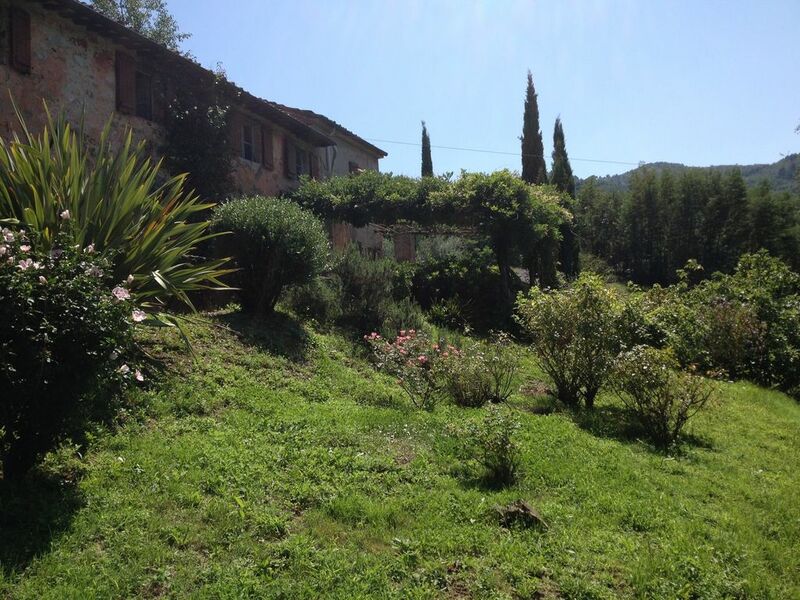 Cafaggio is a lovely rustic two-storey stone farmhouse 14kms north of Lucca. Built in 1656, it has been recently renovated and is now back for renting. It offers the comfort of a new extension with, among other things, a commodious modern kitchen and a beautiful swimming pool. From the privacy of its location atop a hill above the village of Valdottavo, a five-minute walk, you can enjoy a beautiful panoramic view of vineyard-covered hillsides, clusters of farmhouses and the spectacular Apuan Alps in the distance. A terrace in front of the house is covered by a wisteria-covered pergola. The pergola offers a shady respite from the sun - a place to relax and share meals. The spectacular view from the terrace lends itself to reading in quiet contemplation or to relaxed conversation. The furnished kitchen terrace is shaded by a large umbrella and is the perfect place for an evening aperitif. A variety of plants, both wild and cultivated, surround the property. Roses, irises and oleanders thrive. A traditional Tuscan garden of rosemary and lavender lines the walkway. Along the driveway are fig and cherry trees as well as sycamores and acacia for shade. Separate herb and vegetable gardens as well as a fruit orchard are maintained by a local resident and produce from these can be enjoyed in season. Wild flowers abound in the open spaces surrounding the house and birds are a constant delight to watch and hear. The house is full of authentic charm and comfortably furnished. Terracotta tiled floors and white stucco walls offset the exposed beams made from local chestnut trees. A fireplace provides coziness throughout the year. There is high speed internet, a fully furnished library, television/VCR with satellite dish, a stereo and CDs. The ground floor consists of a brand new, fully-equipped kitchen, with professional chef's stove and oven, dishwasher and microwave. The dining and sitting rooms both open directly onto terraces and the pool. A second living room with a convertible queen or two-twin sofa bed leads to a modern-tiled bathroom with a washing machine. On the second floor are three double bedrooms, one with ensuite bath, one single bedroom, a half bathroom with toilet sink and shower, and a study. Towels and antique Italian linens are included in the rent and are ample for eight people. Wifi is available throughout the house. Additional features include fireplace, telephone, TV, video, stereo, washing machine and barbecue. Next to the extra large swimming pool, sits another pergola to provide shade and a very pleasant space for reading, discussing with friends, or a vantage point to observe the children while they play. Les than an hour's drive from Pisa airport, Valdottavo is a small typical village six minutes south of Borgo a Mozzano, gateway to the Garfagnana and undiscovered Northern Tuscany. Valdottavo has excellent food shops where you can find fresh bread and homemade pasta, extraordinary local Pecorino cheeses, wonderful fruits and vegetables, and local wine: red from the Lucchese hills, and a delectable white from nearby Montecarlo. Two large and well-stocked supermarkets are within a short drive. There are many good restaurants nearby that serve the renowned cuisine of northern Tuscany. The Lucca region is one of the last parts of Tuscany to be discovered by tourists. Its treasures include the walled city of Lucca with its museums and monthly antique market, and Barga, whose narrow winding streets lined with ochre, persimmon, or apricot colored houses lead to a spectacular 12th century cathedral of white stone that looks out over the distant Appenines. In between, in the spa town of Bagni di Lucca just fifteen minutes from Valdottavo, are beautiful, uncrowded clay tennis courts, a great public pool with bar/restaurant and, two mornings a week, an open air market. With its large garden and extensive property, Cafaggio is ideal for families or groups of friends. Day trips from the house can include hikes along the marked trails of the Garfagnana; visits to the 18th century villas that surround Lucca including the birthplace of Pinocchio; the beaches of Viareggio or Forte dei Marmi (an hour away); Pisa (40 minutes) and Florence (1 hour 15 minutes). The towns of the Cinque Terre are an easy day trip. Parma is a two and a half hours drive. Shoppers will revel local market at Lucca or in the cashmere market at Forte dei Marmi. It is possible to spend the day sightseeing, museum-going, and shopping, yet at the end of the day to be enjoying a glass of wine and dinner enjoying the refreshing coolness of the pergola. Available activities include clay tennis courts, swimming pool, beaches, antiquing, garden and villa tours, hiking, and trekking. Abbiamo soggiornato in 8 persone per 4 giorni e nonostante il leggero maltempo la proprietà Cafaggio è sempre stata accogliente ed estremamente ben attrezzata per ospitare più persone. Un'esperienza da consigliare e da ripetere, per visitare Lucca e rilassarsi, soprattutto nella bella stagione! Cafaggio a comblé toutes nos attentes et bien au-delà : ce séjour a été parfait. La maison est grande, pleine du charme de son passé en même temps que très bien équipée. Nous étions en famille (4 adultes et deux enfants) et avons pris un plaisir fou à nous baigner dans la très belle piscine (qui offre une vue magnifique), à marcher dans la forêt ou lire sous la tonnelle. La localisation est idéale : en pleine nature, très au calme et en même temps près de toutes les commodités. Le confort de la maison est excellent (cuisine très bien équipée, lits très confortables, 3 salles de bains…), le jardin plein de charme, la pergola idyllique, et pour les rares questions, l’adorable propriétaire était toujours disponible par mel. Elle parle très bien français ce qui facilite aussi les choses. Bref : nous recommandons cette maison et avons déjà décidé d’y revenir l’an prochain.